A "special day" several years ago! This time of the year is FULL of special days, isn’t it? Class parties, Christmas pageants, visits from far-flung relatives and neighborhood gatherings are just a few of the “special events” that punctuate December. In addition, we have special responsibilities at this time of the year as we purchase gifts, decorate our homes and attend year-end committee meetings. All of this is wonderful, but after a while, it can be a bit overwhelming. I will admit that I love Christmastime more than any other time of the year…but even I sometimes crave peaceful, quiet, ordinary days during this festive month. There’s something about an ordinary day, isn’t there? It’s the little routines of daily life that provide a rhythm for our household and keep us connected…eating breakfast by the fireplace in the wintertime, hearing the kids come in the door after school, praying together at dinnertime, listening to the kids chat in Bill’s room at night. As much as I adore the “special,” the ordinary day can give me extraordinary joy…when I remember to slow down enough to pay attention. 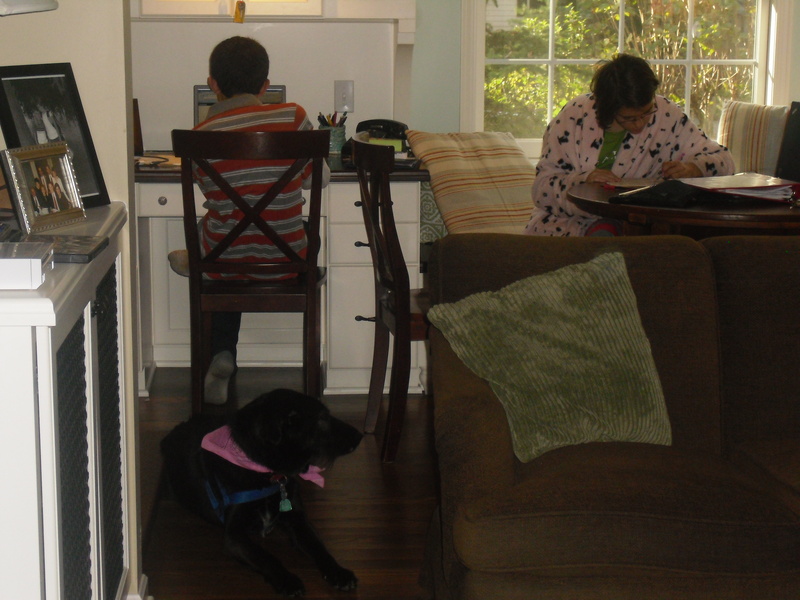 An ordinary day in our house: Annie and Bill studying while Mitzie supervises. The other day, I was busy running errands and had exactly 728 things on my mind…I waited in line to pay for my wrapping paper and ribbon, but was informed that the computer was down and it would take a while to ring up my purchase. I took a deep breath, grateful to have a moment to stand still. We don’t know a lot about Jesus’ life when he was the same age as this young fellow. I’m sure that there were plenty of special days when he had to dress up or help prepare the house or do a few extra chores. He probably enjoyed family celebrations and participated in events at the Temple. Still, I’d like to think that He looked at His mom now and then and said, “Oh, Mom, aren’t we going to have a great day?” I bet they enjoyed ordinary days most of all. 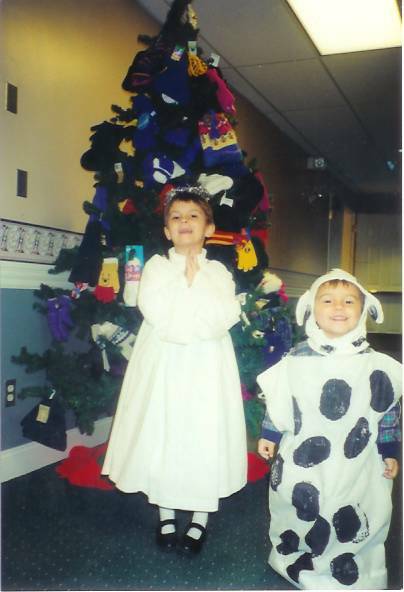 This entry was posted in Parenting, The Home Front and tagged advent, Christmas, family, holidays, special needs by katiewetherbee. Bookmark the permalink.